Ancient philosophers inspire Renaissance thinkers to challenge the old hierarchy of man over beast. Old medieval certainties are cracking under the combined assault of new sciences and rediscovered classics. It’s an age when “natural philosophers” combine scientific discovery with philosophical treatises, and when their Republic of Letters transcends political boundaries in the name of free thought. It’s the age of Descartes, whose mechanical philosophy dismisses animals as “automatons”. But rivals like Gassendi suggest that animals have more in common with humans than he thinks. Ian traces the trail from Paris to the Mughal Court and back to the medical schools of the Enlightenment. He discovers the forgotten story of how Christian mythology, early anatomy, classical thinkers, and Indian medicine came together in respected medical schools that taught students to prescribe a vegetable diet. Play or download (61MB MP3 44min) (via iTunes) or read transcript. Descartes’ readings represent the course of his philosophy, but aren’t in chronological order in the show. Descartes first propounded his mechanistic ideas about animal “automatons” in his 1638 “Discourse on Method”, but articulated it more clearly for us in a letter from 1649. He didn’t touch on it in his First Meditations (1641), but Gassendi did raise it in his response. Just Lady Margaret Cavendish, Duchess of Newcastle. And all the characters in the show who are leading scientists. Background advice came from Renan LaRue and Antonia Lolo. Location photographs are by Vincent Migeotte, my production assistant in Paris. The period music was Anna Simboli’s performance of ‘Signor, quell’infelice’ from L’Orfeo by Montiverdi (CC-BY); and, to evoke 1700 London, Papalin’s performance on recorders of Henry Purcell’s Sonata in C Major (CC-BY), which is dedicated to Lady Rhodia Cavendish. Archive monastery bells recorded by Robin Whittaker, Gregorian chant CC-BY Ramagochi, fast ticking recorded CC-BY Patrick Liberkind, and clockwork toy recorded CC-BY Steven Brown. 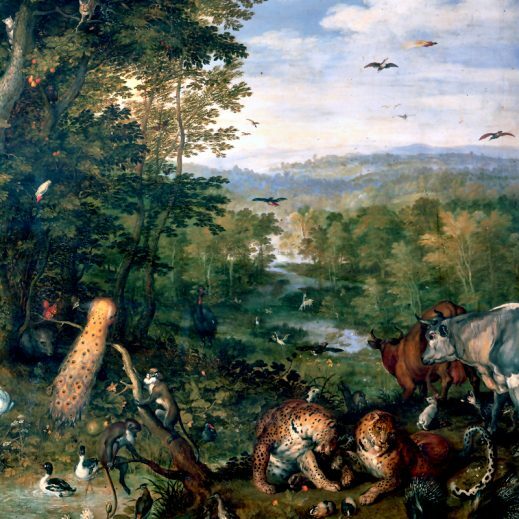 The cover picture is The Garden of Eden, by Jan Brueghel. I’m very grateful to the actors of historical drama group Joot Theatre Company, at the University of Dundee – Connor Ogg (Monro), Iain Brodie (Cullen) and Vachel Novesha. Dr Jo George is their director of Joot Theatre Company, and was extremely helpful in helping set this up, and Brian Hoyle was their studio producer. Other parts were played by Sally Beaumont (Margaret Cavendish) and Guillaume Blanchard.